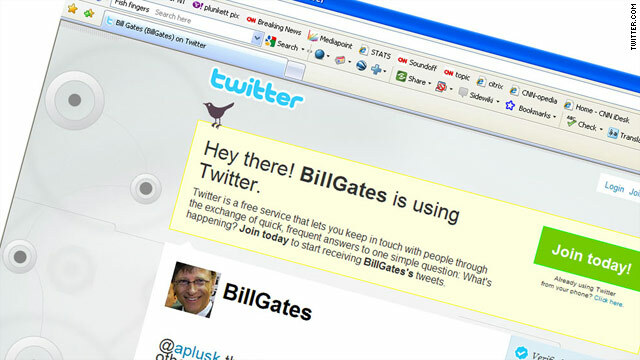 Bill Gates attracted thousands of followers within minutes of joining Twitter. (CNN) -- With a "Hello World," Microsoft co-founder Bill Gates has joined the ranks of the Twitterati, quickly becoming one of the microblogging site's most popular attractions. In the minute it took to write the sentence above, 230 more Twitter users added Gates to their feeds, bringing his total to 165,800 by early Wednesday. Twitter has put a "Verified Account" seal on the feed -- indicating it has checked and determined that @BillGates indeed belongs to Gates. Several fake accounts have, until now, claimed to be Gates'. Is Twitter a force for good in the world? While more and more users add Gates, he seems to remain selective whose feeds he subscribes to. Among the 40 users he follows are charities, celebrities and Microsoft employees. His Twitter biography says he intends to use the service to share "cool things I'm learning through my foundation work and other interests." Since stepping down as chief executive officer of Microsoft in mid-2008, Gates has devoted most of his time to his and his wife's philanthropic organization, the Bill and Melinda Gates Foundation. He remains part-time chairman of the software giant. In the 15 hours the account has been active since Tuesday, Gates has tweeted five times -- focusing on his foundation's work and on news of earthquake-ravaged Haiti. "'Hello World.' Hard at work on my foundation letter -- publishing on 1/25," read his first tweet. Later, he thanked actor and Twitter uber-celebrity Ashton Kutcher (@aplusk) and others who have welcomed him to the service. "I've got a lot to learn about Twitter but look forward to sharing more," the tweet read. Incidentally, Gates has rejoined Facebook. He quit last summer, after saying he was inundated with thousands of friend requests.